Wah, I can’t believe I ordered this back in March and I’m just now photographing it haha – though in my defense, it only arrived after I came back from Asia. 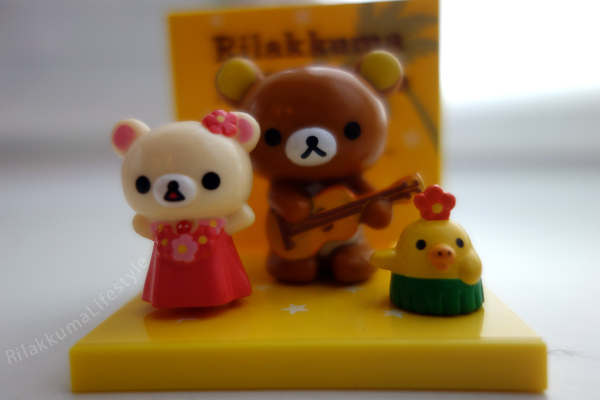 Anyway, here it is, at long last: the Lawson x Aloha Rilakkuma Playset! 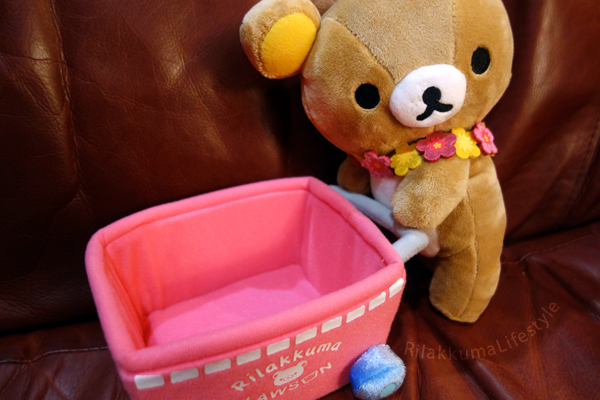 Rilakkuma and his undetachable cart! His flower lei is removable though. This Korilakkuma is so wild to me haha because she’s proportionally much smaller than the Rilakkuma, like she could be Rilakkuma’s plushie… and she herself is holding an Aloha Rilakkuma plushie? 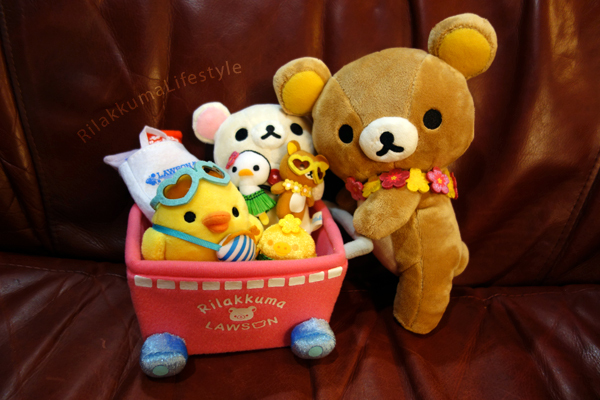 Hahahaha I guess it’s cool that Korilakkuma goes shopping for Rilakkuma plushies just like we do. Eeee this Kiiroitori is so cute and small! And he bears a striking resemblance to the Kiiroitori from the Happiness series (2007) – I guess Kiiroitori has always been in charge of holding the money! 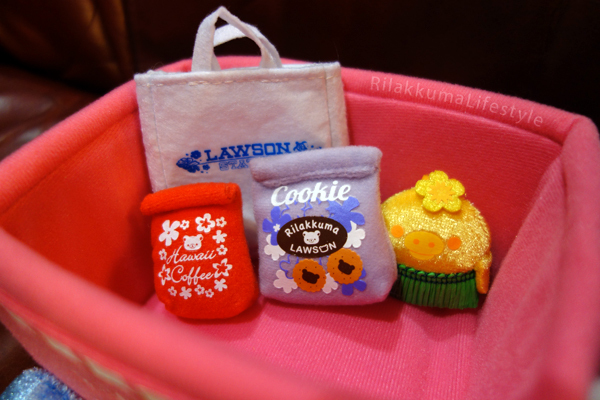 My favorite details: Hawaii coffee, Rilakkuma cookies, and a Kiiroitori honeypot with a Lawson bag to take them home in! Lawson/HMV started taking pre-orders for this set way back in February of this year – wow that was a long time ago! They sold out before the pre-order deadline of April 15, and were finally sent out in mid-June! I actually haven’t finished covering all the cool Rilakkuma things my dad bought in Japan, so here’s another entry that jives with today’s Aloha Rilakkuma theme! I assembled this one myself! Well assembly is pretty easy – just 2 stickers for the background and the ground, and then fitting the 2 yellow boards and the figurines in the right spot! My family really likes the guitar-playing Rilakkuma because there’s an old photo of my dad playing the guitar in exactly the same pose and expression hahaha so it’s kind of like seeing my dad in bear form. This figurine set was made by Kabaya under domestic license – Kabaya seems to be mostly a sweets company, which makes sense (I guess) because this set also inexplicably came with an unmarked bag of candy inside (what). ← The Rilakkuma Reference Sheet! Wow, has it really been that long since you ordered this plush? It’s really adorable though! 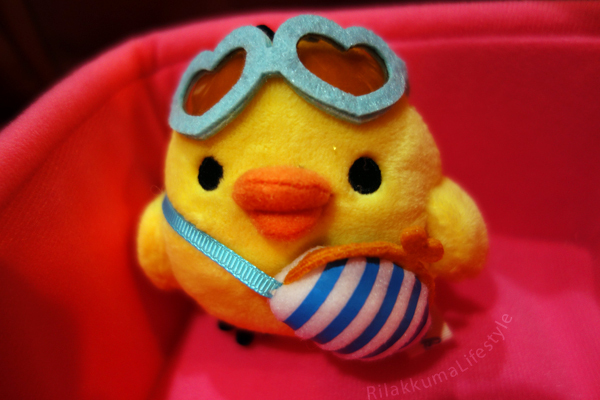 I love Kiiroitori the best, with the sunglasses and the purse, he’s ready to go shipping! 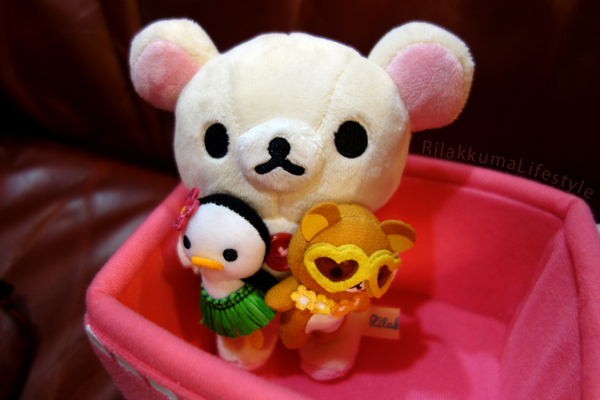 Korilakkuma is almost the same size as Kiiroitori, haha. I really like that figurine, it’s so cute and relaxing to look at. Yes, the details really make me smile! I was just looking up my KFC x Rilakkuma box, and this Lawson Aloha set really looks just like the illustration! Even the cookie bags and the coffee are the same design hahaha it’s so cute! Aww the figures are so cute!! They match well with the Lawson plushie, I’m happy you got yours ;) it’s funny how fast that one sold out! Thanks for sharing! They are so cute!! The little grocery goods are so kawaii! I don’t have this playset so it’s nice to see detailed photos of them! Thanks so much! I’m really excited to finally start medical school, but I know it’s a really long and difficult journey so I’m already kind of bracing myself. Hehe :D good to hear you are excited about it! It’s a very rewarding career and the journey may be long and at times difficult, but it’s definitely all worth it in the end! And yes! Please don’t lose sight of enjoying life OUTSIDE med school! 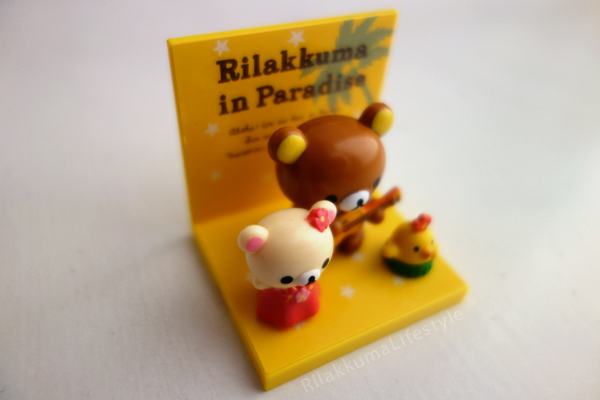 :D And Rilakkuma & blogging is a good place to start!!!!!!!!! And thank you, you’re too kind hehe, I just found my happy medium :D you can and will too!